Completing a marathon is the penultimate athletic accomplishment for many people in which many months of training and preparation is undertaken for that special day. It is important to understand some of the basic concepts of training, so you know what to expect and understand how to choose a plan which best suits your goals. As someone who has completed several marathons, I can share several key aspects which, when managed appropriately, can help to promote the best experience and attain your race goals. These key aspects include: training plan, mental training, nutrition, and recovery. When it comes to deciding how to train for the marathon one has to realize that no one way is right for everyone.Some respond well to running a very high weekly volume of lower intensity miles, while others do better with higher intensity, yet less overall mileage. The decision on the type of training which is best is something that must take into consideration your athletic background, if any, and the number of hours per week you are able to commit to training. A training plan generally focuses on high mileage or high intensity, but not both, so remember to keep that in mind when researching the plan to take you successfully across the finish line. This phase of training is the most important as it creates the foundation which you are able to build upon for the rest of your training plan. This is the time during which you are preparing your body to tolerate the increased and targeted training demands found in later phases. It is also the time to improve technique and efficiency which will be carried forward into future training. This phase is all about gains, getting faster, and increasing endurance. The type of training found during this period of time is many times of greater intensity, with more specific goals. When going into a build phase with a solid foundation, many athletes will experience substantial gains since they put in the initial work to tolerate the high demands of this portion of the training plan. This can also be referred to as the taper period as it is when the training volume will generally decrease quite substantially in preparation for the upcoming race.f The goal is to maintain all of the gains you have acquired in the previous months, but making it to race day well recovered and with fresh legs. While the other phases come in 4 week blocks, this period of time is generally the last 2 weeks before the big race. 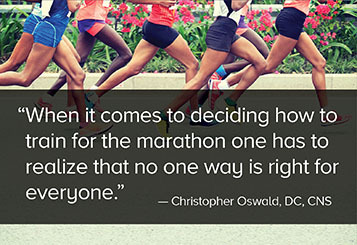 The popular cliché is that running a marathon is 10% physical and 90% mental, and that honestly is incredibly true. If you are unable to maintain focus for the duration of the race, there is a very good chance that you will not finish, or finish hours later than your training dictated. For this reason it is important to practice the mental skills necessary to keep putting one foot in front of the other. Visualize yourself crossing the finish line with a big smile each and every training run. Practice keeping yourself relaxed in the face of uncertainty, as many unexpected circumstances can and will arise on race day. Maintain positive self-talk, as once you mentally get down, your race is all but over. Focus on your race plan and accept that it may change during the race, building confidence to overcome unforeseen challenges. Many first time marathoners underestimate the importance of a nutrition plan and practicing it during training. Over the number of hours it takes to complete a marathon, additional calories must be ingested. Practice is essential to be able to manage calorie intake and not run into the dreaded “gut rot.” A great strategy to follow is to learn the types of energy gels or food that will be provided at your chosen race and start to take it along with you during any run lasting more than 2 hours. While timing and quantity of calories varies for everyone, ingesting 100 calories every 45 minutes is a great place to start and a common recommendation you will find on your energy gel package. This is one of the biggest challenges I see with amateur athletes and even with some professionals. The human body only has the capacity to respond to a finite amount of training and without proper recovery the accumulated stress of training can become a real nightmare. I have seen far too many people put in the time and training only to get hurt or sick right before the big race and not be able to participate. Prevention of over-training and maintaining adequate recovery should be a priority and there are several early warning signs to monitor. It is important to keep your training in context. Amateur athletes must remember that professional are paid, so they focus 100% of their energy on their craft, which includes dedicated time for recovery. When choosing training plans, don’t choose something intended for a professional if, after you train, you are off to work (to earn money to pay for your gear and race fees), while a pro is likely taking a nap or receiving a massage or other body work. Combined with a genetic predisposition for high performance, the available time for recovery is a primary reason why professional athletes are able to turn in seemingly superhuman results. If you are able to consistently balance the many aspects of training and regular life you may just surprise yourself by doing something you previously thought was impossible! Go out and find that perfect plan for you and remember – you decided to do a marathon, because you thought it would be FUN! Christopher Oswald is a chiropractor, certified nutrition specialist, and a graduate of Northwestern Health Sciences University.He practices at Hudson Headache in Wisconsin, focusing on whole body care for those suffering from head and neck pain. In practice he utilizes the combination of functional movement assessment and functional medicine principles to identify the underlying causes, which guides his direction for the appropriate clinical care. Additionally, he is an Advisory Board Member of Nordic Naturals, and the National Association of Nutrition Professionals. 1. Bompa T., Haff G. Periodization. Champaign, IL. : Human Kinetics; 2009. 2. Gleeson M. Biochemical and Immunological Markers of Over-Training. Journal of Sports Science & Medicine. 2002;1(2):31-41.